Thanet Vikings Table Tennis Club Juniors scooped silver at the National Junior League competition in Royal Tunbridge Wells. The team was captained by Hugo Ursell, with members Daniel Wren, Louis Lines and Henry Mileham standing in for Jack Roberts. 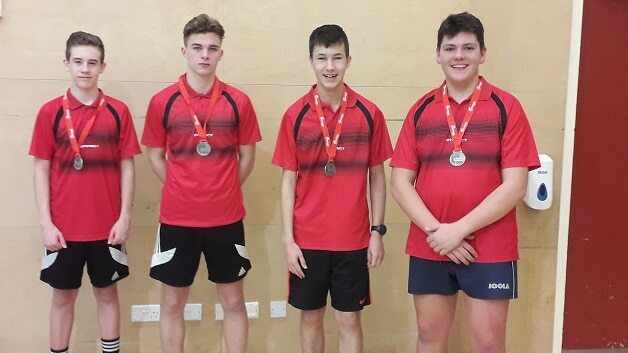 The Thanet lads are aged from 13 to 17 years and all play and practice at Thanet Vikings TTC as well as competing in the Isle of Thanet league . The competition is run over four dates throughout the winter season with the team winning the three previous competitions before the final. Over the course of the finals the lads played 30 games between them, consisting of some hard fought matches which resulted in them finishing second to Cleeve Park from Sidcup. It is the first time TVTTC has entered a team in the National Junior League. Thanet Vikings Table Tennis Club has been open for two years and is based at St Anthony’s School, Tenterden Road, Margate on Thursdays between 5pm and 10pm. Junior and beginners are welcome from 5pm to 7pm and seniors are welcome to attend the club night from 7.30pm to 10pm.